1) Combine the dried cherries with brandy, rum, or water. Cover and microwave for 1 to 2 minutes, stir, then set aside to cool. 2) Preheat the oven to 325°F. Lightly grease the pans of your choice: two 8 1/2" x 4 1/2" loaf pans, five 7" wooden bakers, six 7" paper bake & give pans, one 12-cup bundt-style pan, or two 6-cup bundt-style pans. 3) In a large bowl, beat together the butter, sugar, baking powder, salt, flavors, and cake enhancer. 4) Beat in the eggs one at time. Stir in the flour alternately with the milk. 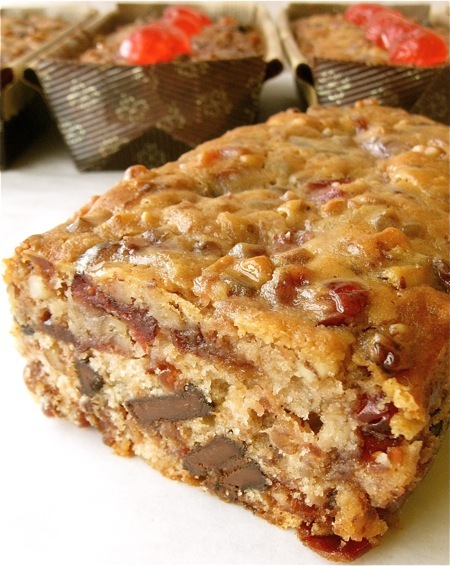 5) Combine the dried cherries and their liquid, candied cherries, Jammy Bits, chocolate chips, and nuts. Stir into the cake batter. 6) Spoon the batter into the lightly greased pans, filling them about three-quarters full. Bake for 50 to 100 minutes; the smaller the pan, the shorter the baking time. When done, the cakes will be a light golden brown all over, and a cake tester inserted into the center will come out clean. 7) Remove the cakes from the oven. If you're removing them from the pan(s), wait about 10 minutes, then turn them out onto a rack. If you've baked them in paper pans, they can stay right in the pan. 8) If you're using simple syrup, brush the warm cakes all over, continuing to brush until you've used it all. If you choose not to use the syrup, you may wish to brush the warm cake(s) with brandy or the liquor of your choice. 9) When completely cooled, wrap well and let rest at least 24 hours (or for up to a month, brushing with liquor or syrup weekly), before serving. Yield: 1 large bundt-style cake; 2 small bundt-style cakes; 2 standard loaves; or 5 to 6 smaller loaves.